Cutting-edge concept car wins CES “Design and Engineering Showcase" award. Replicate the look and feel of a Bentley GT interior after integrating new infrared display technology in the center console. Build a virtual 3D model of the Bentley GT dashboard interior to simulate look and optimize design prior to final build. Disassemble and rebuild the dashboard with a 1ft. cubic box of custom prototype technology from multiple suppliers. 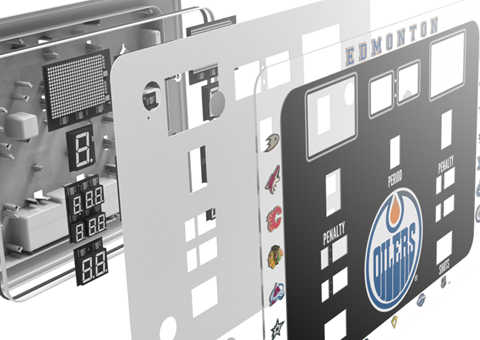 Move from concept to completion with a fully reassembled dashboard in 3 months to meet CES tradeshow deadline. Creation of custom leatherwork to match Bentley interior plus rapid prototyping of new structural parts to reassemble the car. The Bentley concept car made it to Las Vegas on time and went on to win CES “Design & Engineering” showcase award. 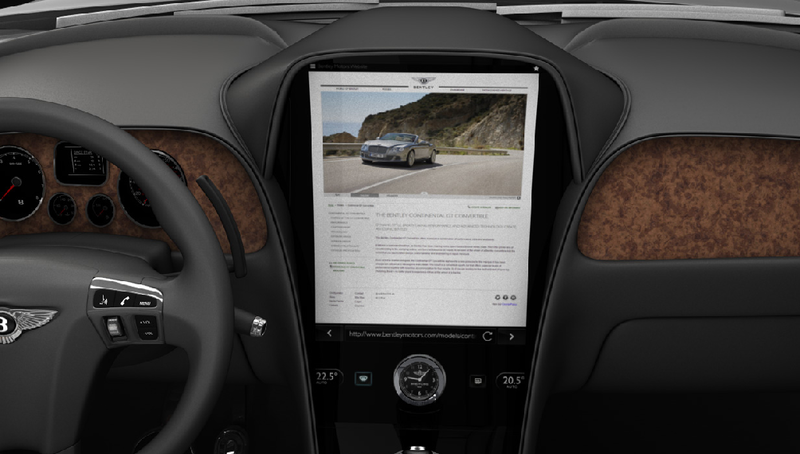 QNX approached Design 1st with the concept to drop a roughly 1 ft² of disruptive touchscreen technology into the interior of a brand-new Bentley Continental in time for CES, three months away. The first step in the design of the project was the complete disassembly of the existing Bentley dashboard interior and build of virtual 3D CAD model. This was followed by the planning of custom parts, including stitched leather to match the luxurious interior. 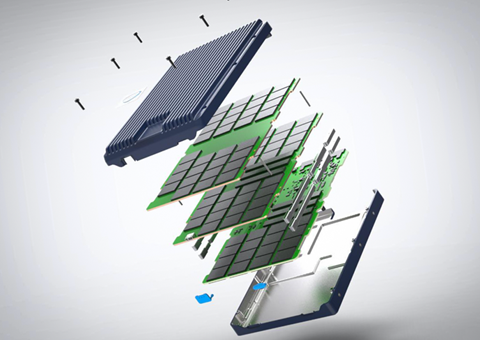 "Complete disassembly of the Bentley dashboard"
"Rerouting existing venting to provide cooling for touchscreen device"
Once 3D CAD model was reviewed, plans were made to reroute existing venting and air conditioning to provide sufficient cooling to touchscreen device. This was followed by tapping into the electrical harness of the Bentley to integrate new touch screen technology into the existing systems. The main engineering challenge here was keeping track of all removed components to ensure they would go back together in the right order. Using rapid prototyping, all cosmetic and structural parts of the Bentley were built and tested to ensure proper fit the first time. This was followed by a pre-production build of the interior car structure to ensure fit and function. This step allowed the design and engineering teams to de-risk the final build and ensure the car was ready for CES show. 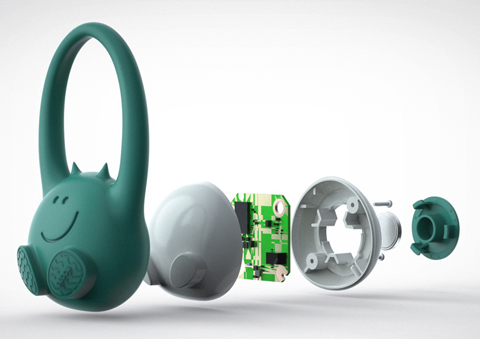 "Rapid prototyping of all cosmetic and structural parts." 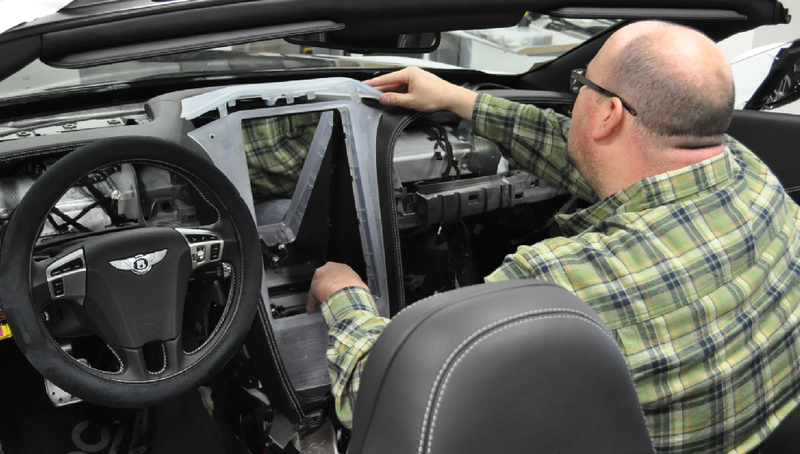 "Replicating the original hand leather-stitching of Bentley dash"
The final build and reassembly of the Bentley interior involved multiple teams working together to meet the strict deadline. One wrong move or misstep in the assembly of the interior could delay the project. But with help of some on-the-fly adjustments the new touchscreen system was fully integrated and working. 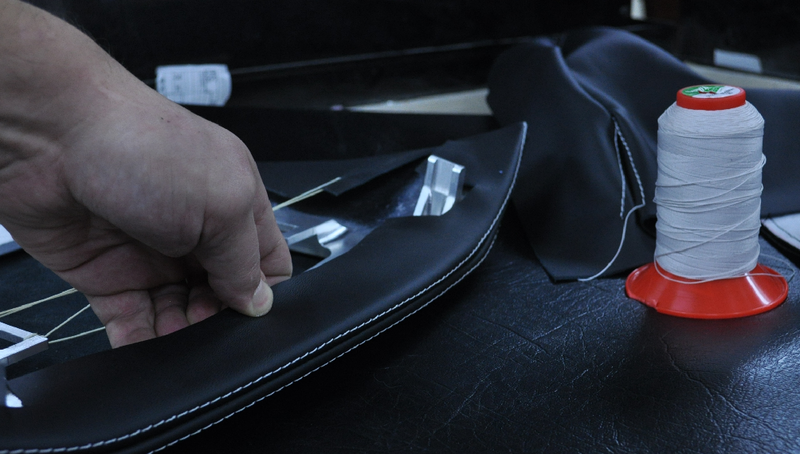 The last step was matching the leather-stitched Bentley dash, which was hand-done using two materials. This finishing step helped blend the cutting-edge technology with the Bentley design.